The BoBunny Head Over Heels Mini Album is so fresh and funky and was the perfect thing for me to use to make a gift of love for my husband. Every year, I try to make him something for Valentine's Day as a way to show him how much I love him...not just today, but every day of the year. 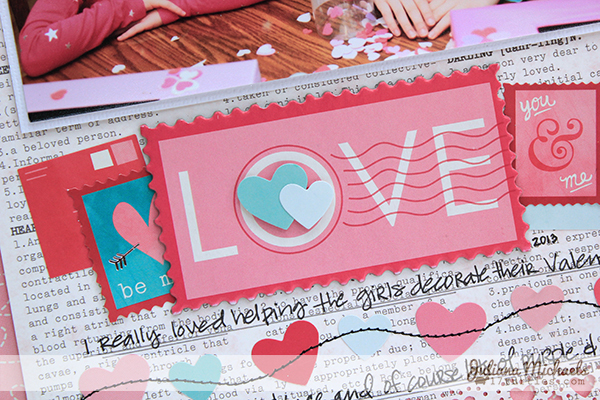 I am sharing with you here some of the inside pages and close ups of the extra little things I added to the already fabulous embellishments that make up the Head Over Heels collection. 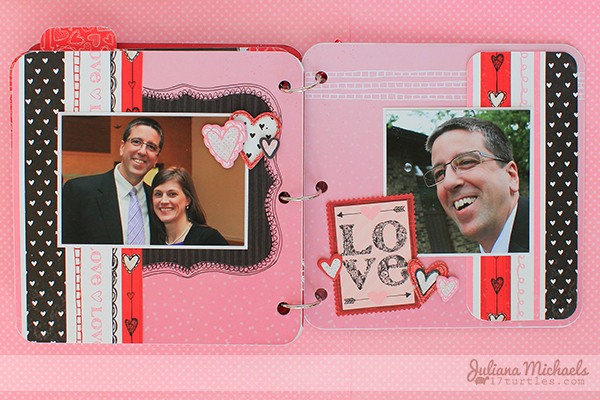 If you are interested in seeing the front of my You and Me Mini Album and the other pages, then make sure you visit the BoBunny blog. I repeated a couple of techniques throughout my album to help it flow from one page to the next. One of those techniques was the use of a black pen to hand draw lines and other little doodles on the edges of the papers and die cuts. 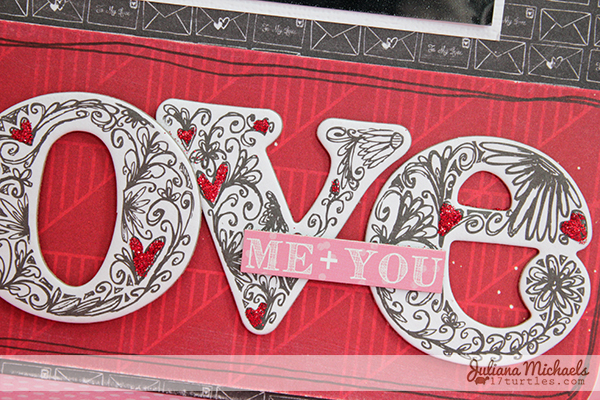 The Head Over Heels collections has a hand drawn or doodled look to it, so this helped reinforce that style. The other technique I used was to apply glitter glue to some of the chipboard and sticker accents that I used throughout the album. 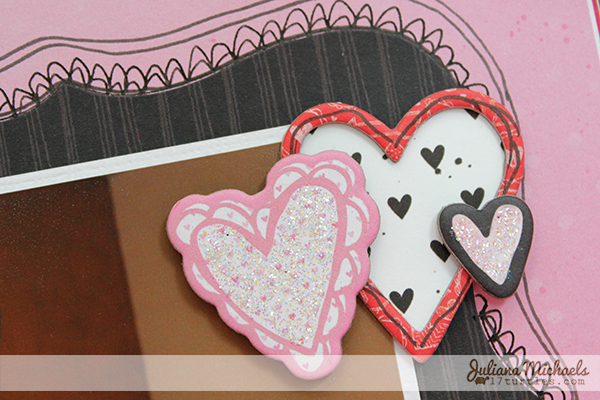 I applied it in various places on these pieces to help highlight the various heart shapes on each page. Christmas has come and gone, but that doesn't mean we have to stop scrapping those Christmas photos! As some of you may or may not know, but we recently adopted a 9 year old golden retriever named Milo. He has become our pride and joy! This was of course, his first Christmas with us, so I couldn't resist putting a Santa hat on him and taking a photo. He wasn't thrilled by it, but he sure looked cute! 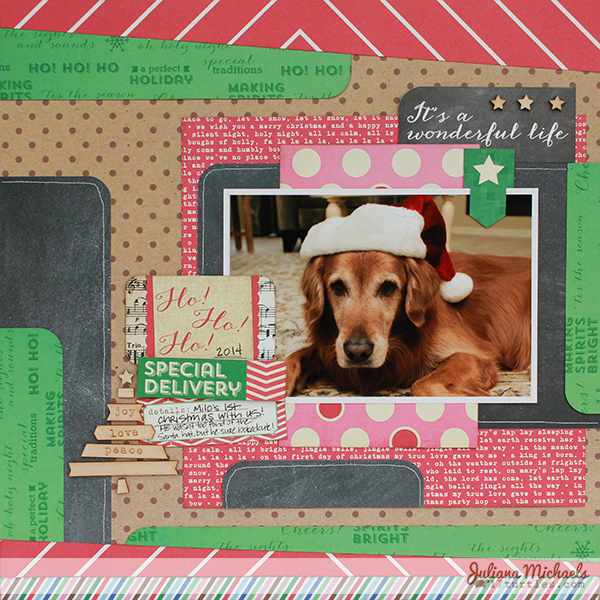 To create my layout I used the Noel collection by Elle's Studio. With it's fabulous Christmas theme it was perfect for this photo of Milo. 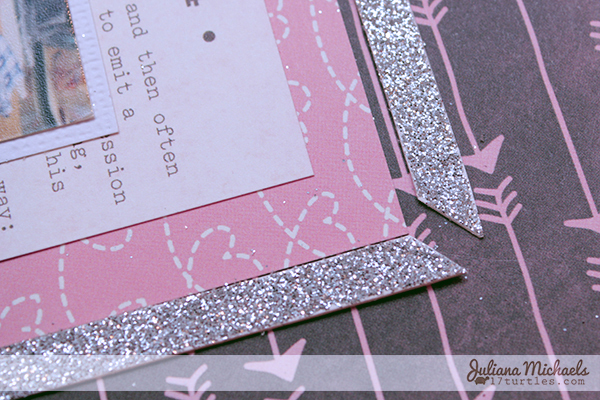 I had fun trying my hand at the layered top and bottom borders that seems to be so trendy right now. 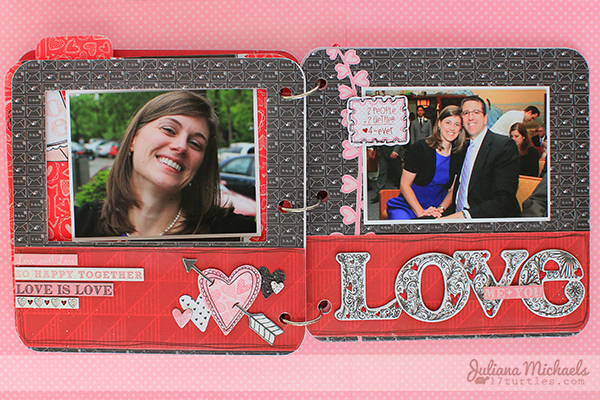 This layout is part of the January Inspiration Gallery over at Elle's Studio. 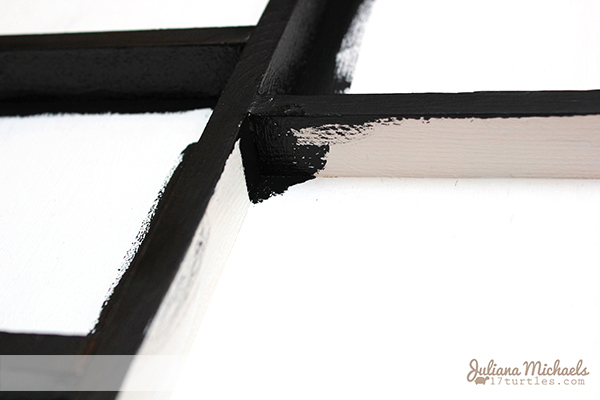 For more fabulous Elle's Studio inspiration, I invite you to visit the gallery and blog. 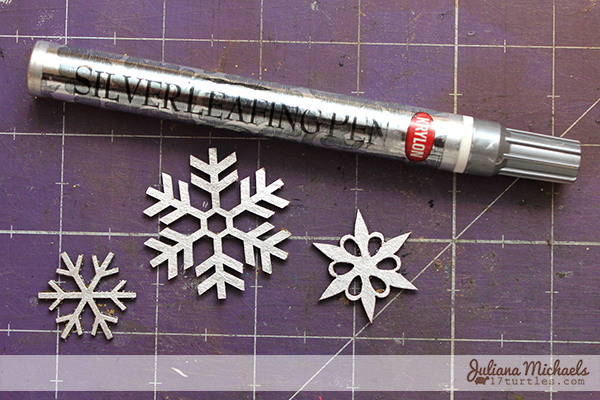 Are you looking for a fun way to embellish plain chipboard snowflakes? Look no further. 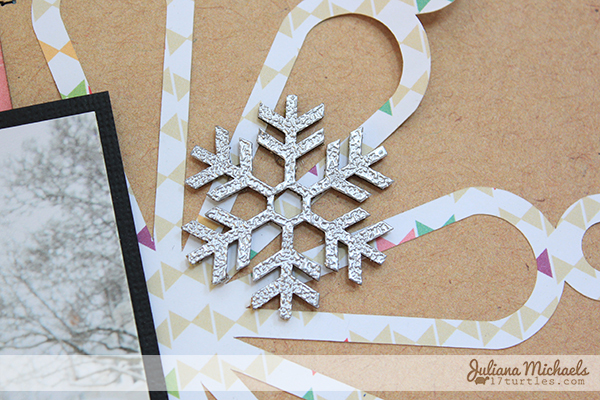 I have a simple tutorial for you today that will help you bring a winter wonderland to your next chipboard project! 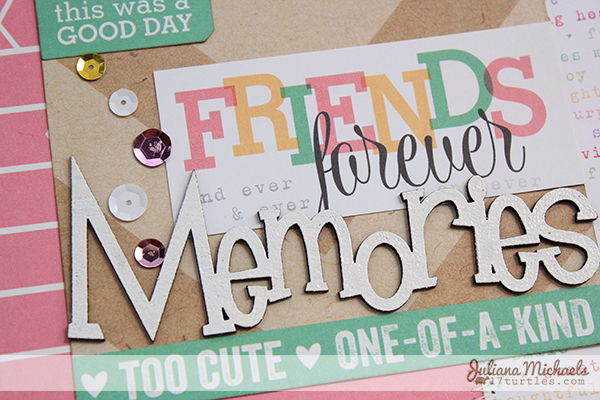 Here is a sneak peek of my "Magical Moment" scrapbook page I have on the Leaky Shed Studio blog today. 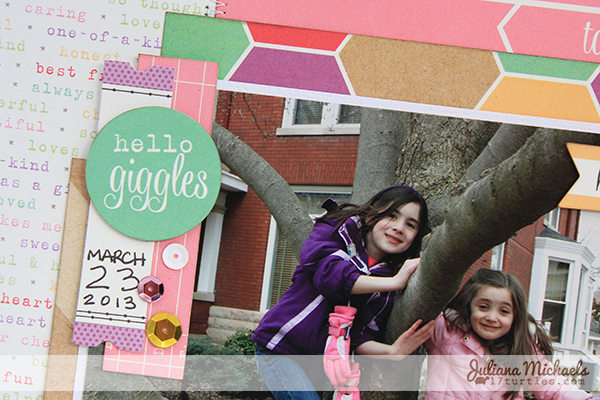 I'd love for you to visit their blog to see the full layout! 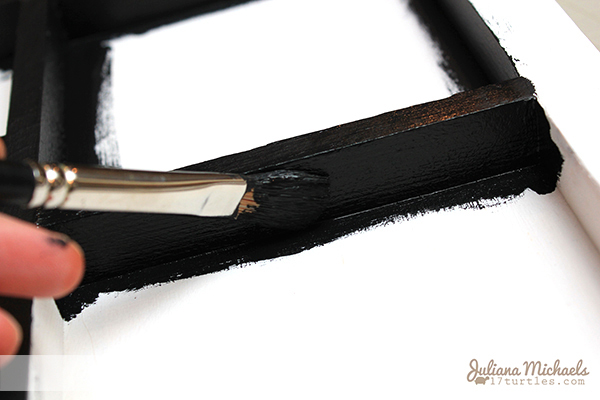 Color the chipboard with a Krylon Silver Leafing Pen. 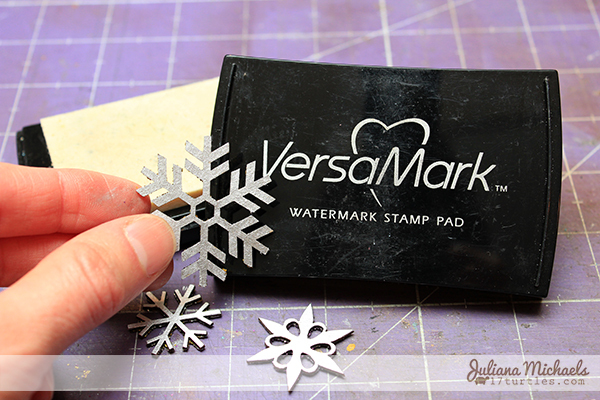 Ink the silver colored chipboard with VersaMark Watermark Ink. 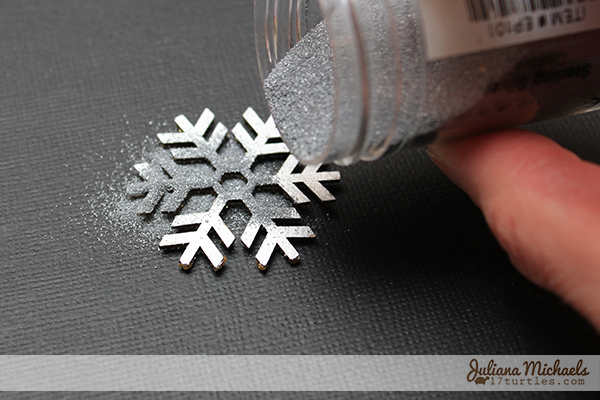 Sprinkle silver embossing powder onto the snowflake. 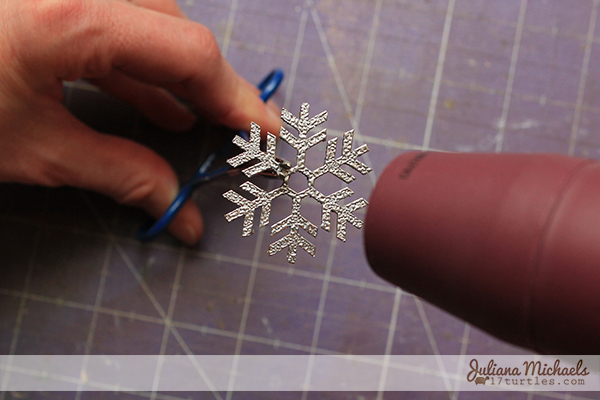 Pick up and hold the embossing powder covered snowflake with a pair of tweezers, etc that have heat resistant handles so that you do not burn your fingers. I use a hemostat with heat resistant handles. 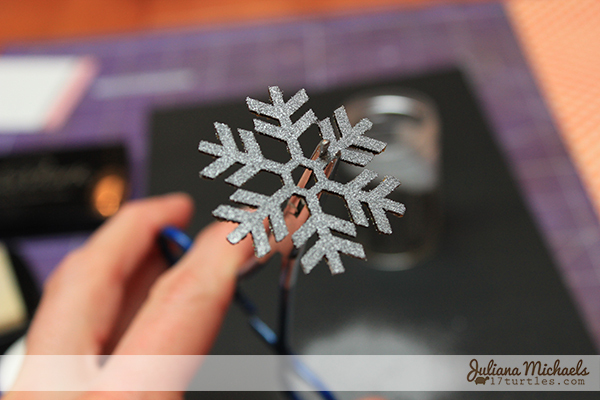 Use a heat gun to melt the embossing powder. Remember to hold the heat tool about 6" away from your piece. Sweep the heat tool over the image and don't hold it in one spot for too long. 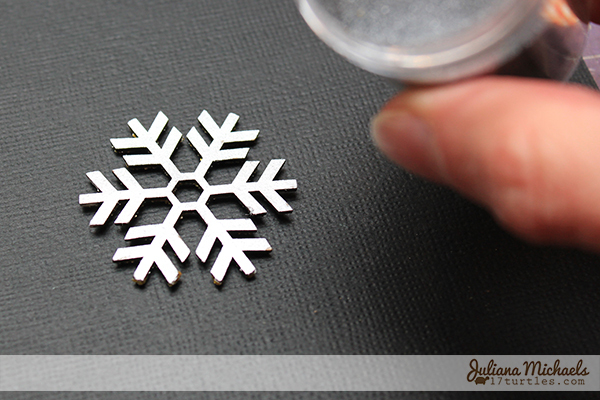 As the embossing powder melts, it will become more smooth and dimensional. If you overheat the powder, it will bubble and could burn the chipboard. 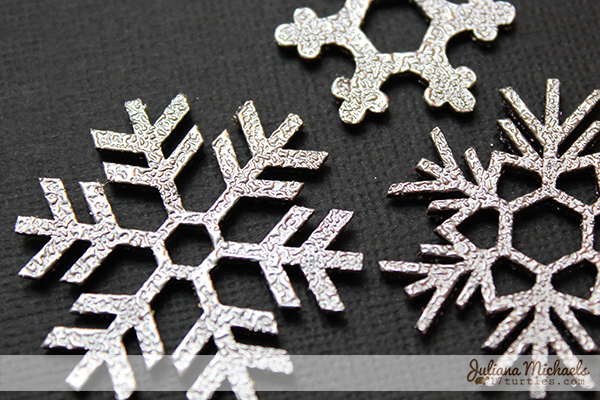 Here are the completed Silver Snowflakes, ready to attach to your next project! I have been waiting for months to share what I am finally able to share today. I am a member of the first ever 3 Birds Studio Design Team and I am also their new Design Team and Social Media Coordinator! 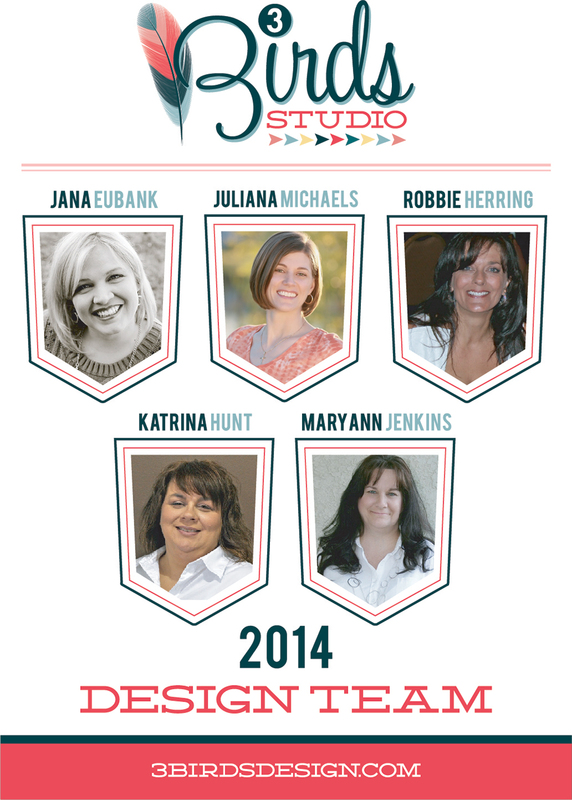 As you can see, the 3 Birds Studio Design Team is an amazing group of talented ladies. I feel blessed to be working with them and to be able to call each of them a friend! I am so excited for this new adventure and I'm really looking forward to sharing with you all that 3 Birds has to offer. I know you're going to be inspired! 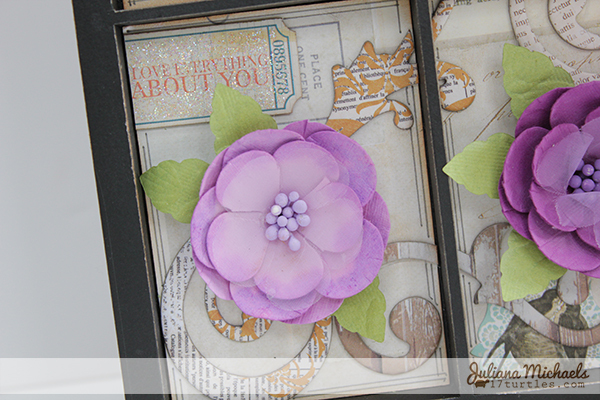 This week on the BoBunny blog the Design Team has been creating projects using BoBunny's gorgeous Blossoms. 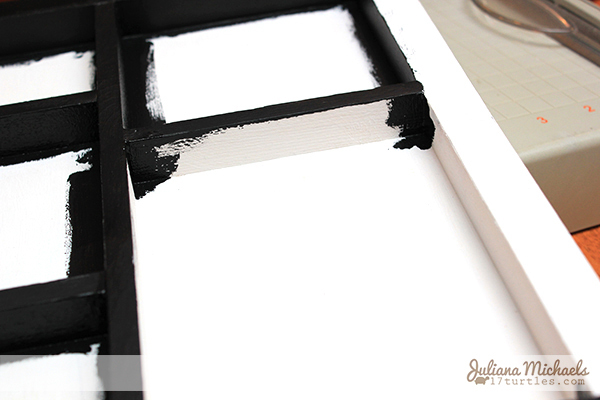 Today, I am sharing what I created...a Blossoms Printers Tray! I selected a rainbow of colors from the various Pansy Blossoms and placed one Blossom in each opening. 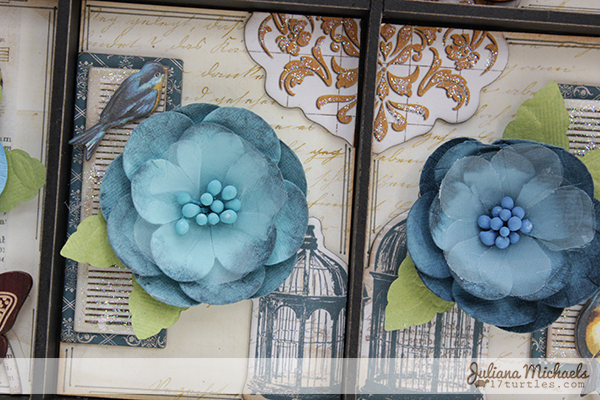 The background is the Woodland Winter Journal paper. I measured each opening and cut the paper into pieces to fit into each opening. 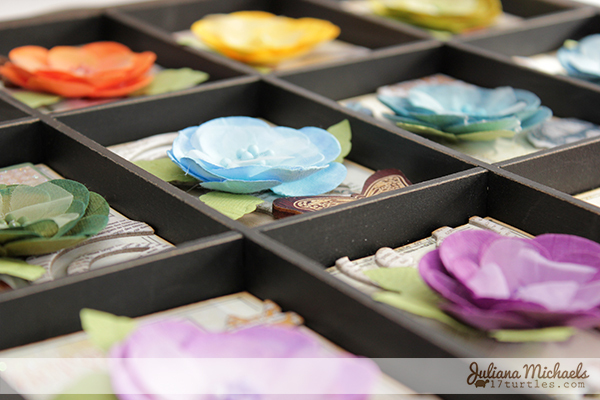 Then I filled each box with a variety of Chipboard, Stickers and Kraft Wood embellishments. 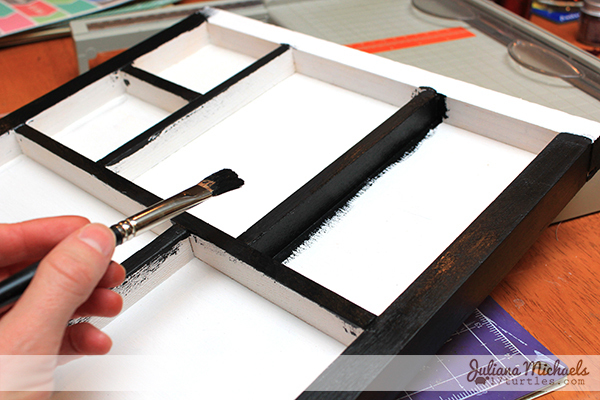 To see my full project and more details on how I created my Blossoms Printer Tray, please visit the BoBunny Blog. The Penelope collection by Elle's Studio, which they released during CHA Summer 2013 was love at first sight for me. The color combination is what caught my attention because of the color purple that is sprinkled throughout the collection. Purple has long been one of my favorite colors and to have it used in such a fabulous collection made me do a little scrappy happy dance! It was also one of those collections that said "I know what photos I want to scrap with this!" I have to be honest and tell you that I don't have that thought very often with a paper collection. I usually love them and buy them and then figure out what photos to put with them. This time, it was the other way around. I had the photos and I had to have this collection to go with them! 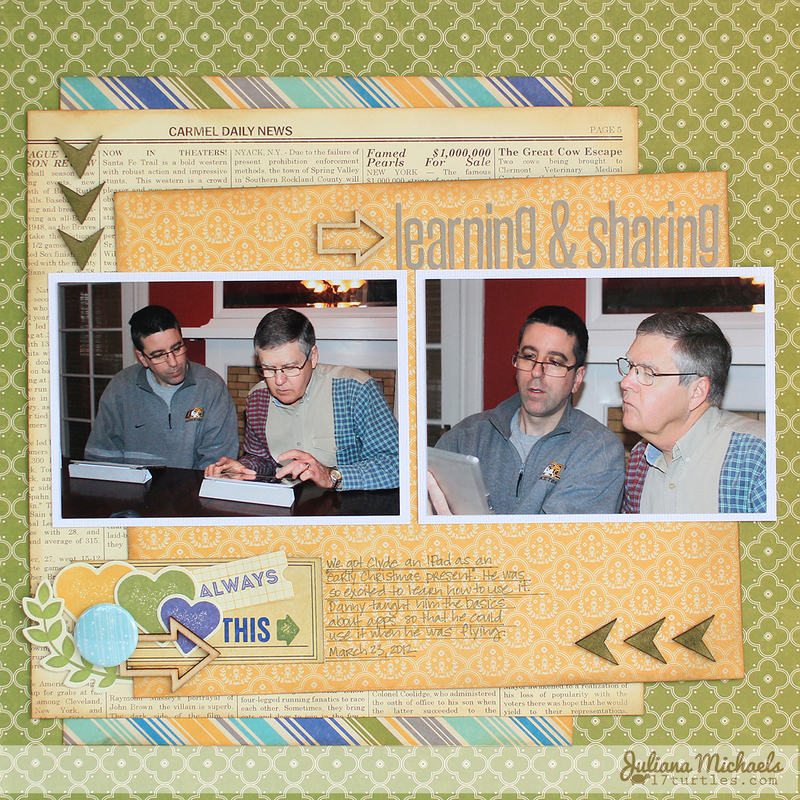 The scrapbook page I am sharing today features one of those photos that had to be scrapped with this collection. My nieces pink and purple coats are the reason why! 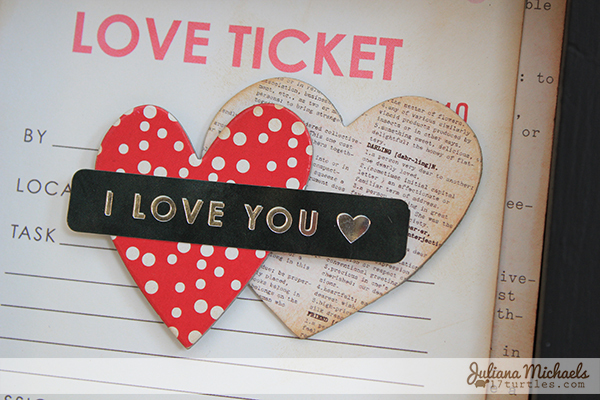 This page is also part of the Elle's Studio Inspiration Gallery for the month of January. Make sure you stop by and check it out. The gallery is filled with so many fantastic projects. You are sure to be inspired! 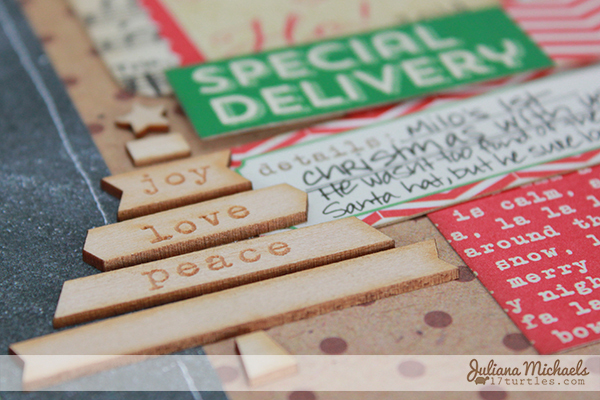 Besides the fabulous Elle's Studio products, I also incorporated a piece of Leaky Shed Studio Chipboard for my title. 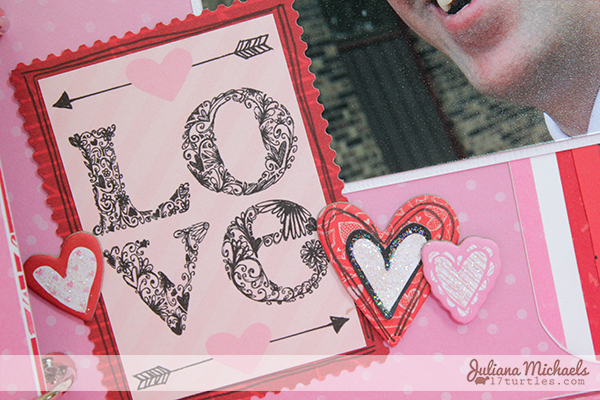 I simply embossed it with white embossing powder before adding it to the layout. I am pleased to announce that I have another FREE Digital Cutting File to share with you today called Let It Snow. 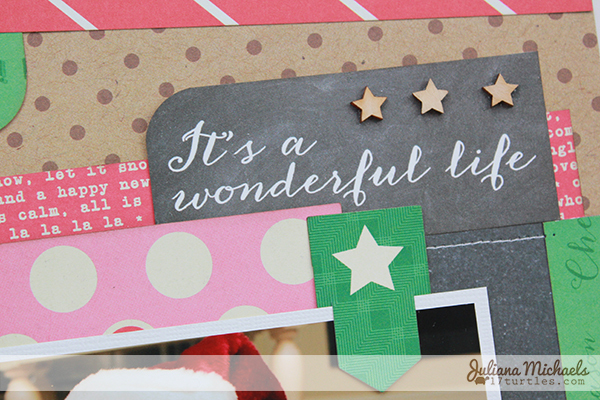 Even more exciting is that I have another Guest Designer, Carolyn Wolf, who has created some fantastic projects using this cut file to help inspire and delight you! 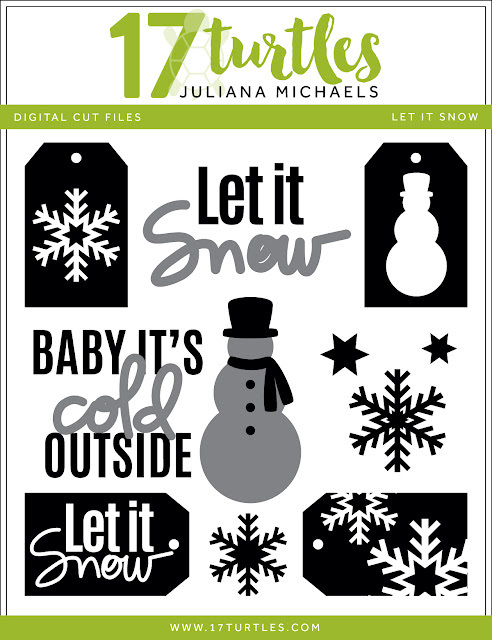 Let It Snow was created with all of your winter wonderland and snow fun activities in mind. 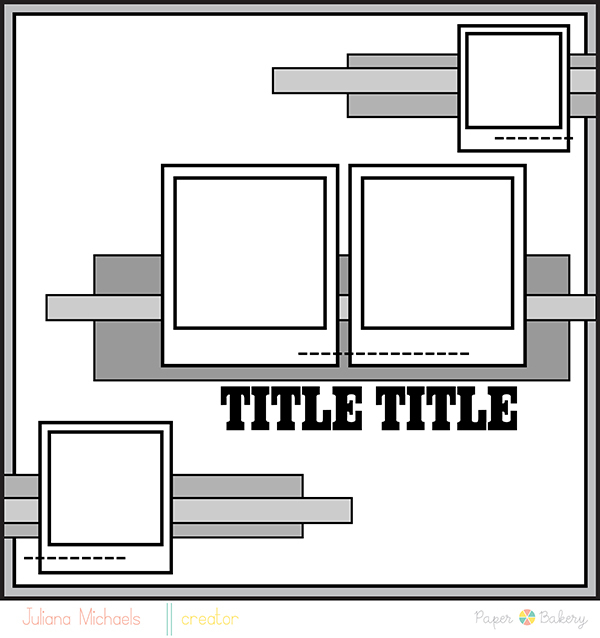 It contains four tags, multiple coordinating images and two title pieces. You are sure to find that you can use these images for a full range of projects, including cards, home decor and scrapbook pages. This digital file is available in both SVG and Studio formats and you may download this digital cut file for FREE for your own personal use. 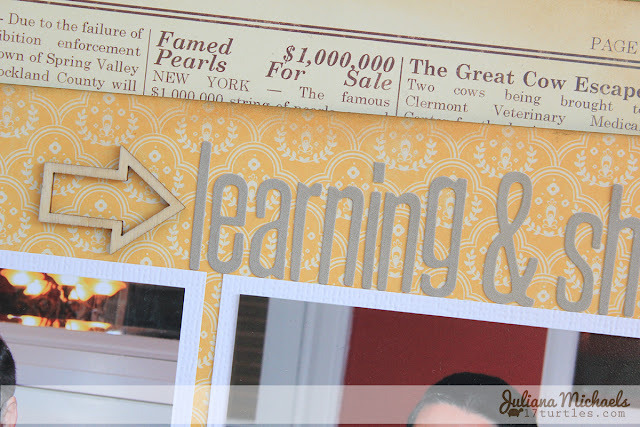 Here are a couple sneak peeks of two of the amazing projects that Carolyn Wolff created using this cut file. Please visit her blog to see all three of her projects! Aren't the details on these just amazing? I love what she did with the snowman!!! Thanks so much Carolyn for playing and creating with my cut file and thank you all for stopping by today! 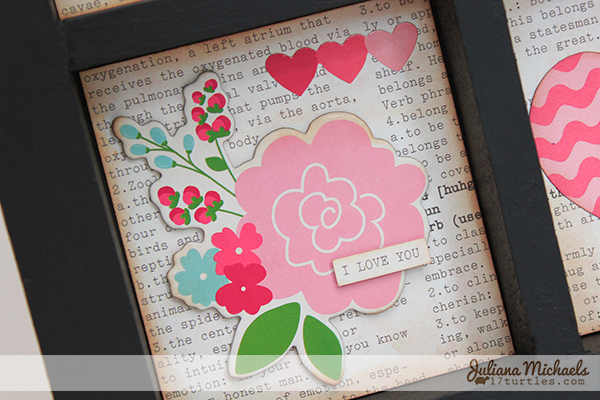 Sketch Challenge 19 is live on the Paper Bakery Blog today! 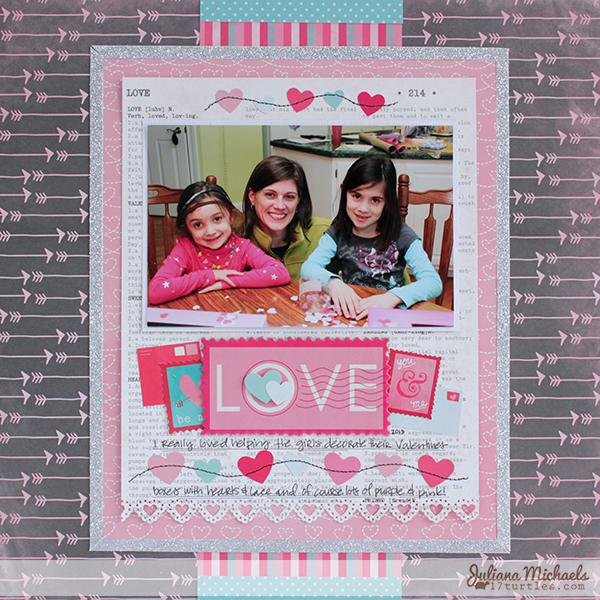 This new scrapbook page sketch features room for four photos, or you can fill those photo spots with some fun patterned papers and embellishments. I can't wait to see how it inspires you!!! 1.) We will have a new Sketch Challenge every two weeks. Play along for your chance to win a $10 coupon to the Paper Bakery Shop. 2.) 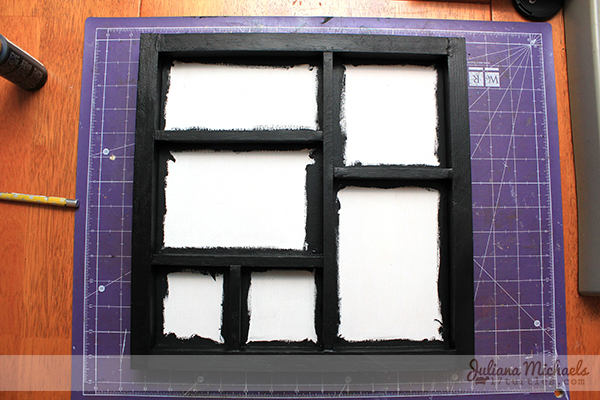 Make a layout or project inspired by the sketch. Be creative and have fun! We would love to see what you create using a Paper Bakery kit however, using a kit is not required for you to play along. 3.) Take a picture and link it up on the sidebar of the Paper Bakery blog using the INLINKZ widget by the due date February 1, 2014. 4.) Winners will be randomly selected and we will post them on the Paper Bakery Facebook page and on the Paper Bakery blog. Make sure to follow us on both to find out if you are the winner!!! I hope you are inspired by this sketch and will play along! I'm looking forward to seeing what you create and share!!! I know that CHA Winter 2014 has just finished, but I am still enjoying quite a few collections from the Summer. 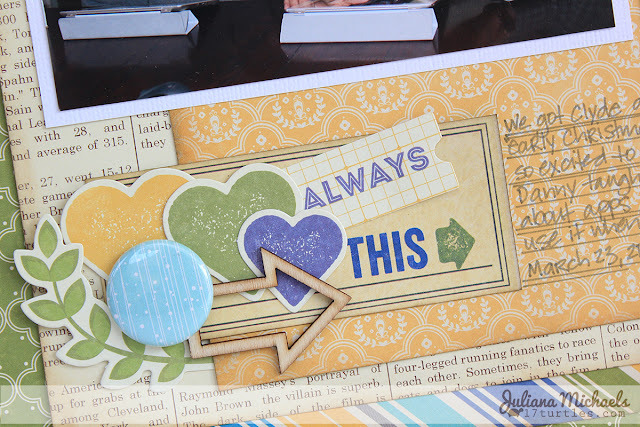 Today, I have a layout I recently created using one of my favorite collections from the Summer CHA scrapbook releases - Cold Avocado Soup by Jillibean Soup. It took me a while to get my hands on it, but when I did, I had a great time creating several layouts. The layout I am sharing with you today came together by layering several papers from the collection along with a variety of fun embellishments. 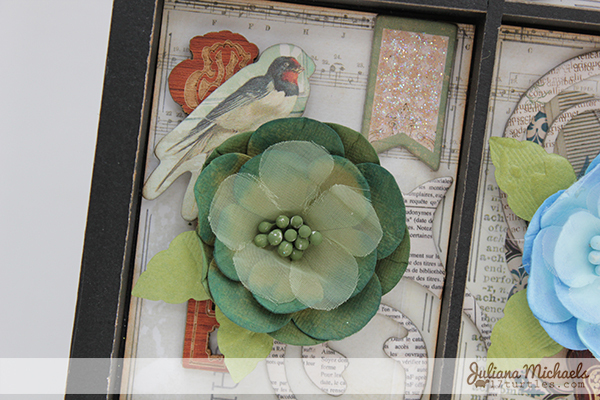 This group of embellishments is a combination of Jillibean Soup Pea Pod Parts, Freckled Fawn wood veneer, and Paper Bakery Flair. The green arrows are Dusty Attic Chipboard that I colored with Ranger Distress Ink in Peeled Paint. Pebbles Inc. released one fabulous Valentine's themed range with their Yours Truly collection. 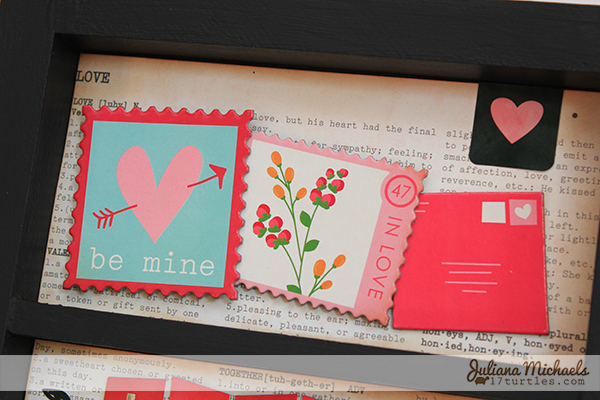 It is filled with sweet words of love and devotion, delightful icons of hearts and lovebirds and a vivid color palette of red and pink accented by robin’s egg blue. I have loved creating with it! 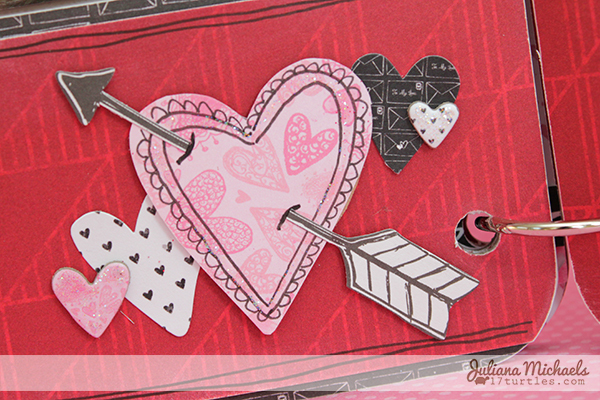 One of my first projects, was a set of Mini Valentines Cards. 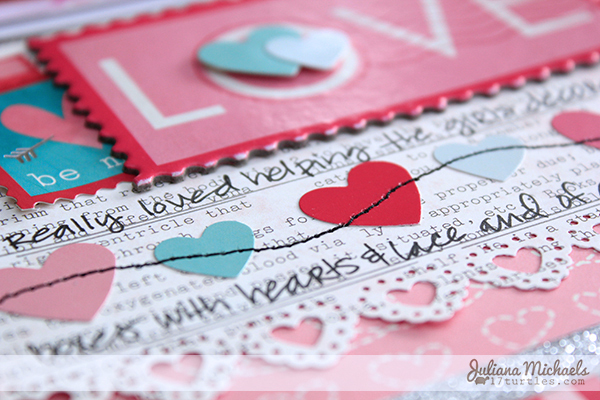 I also shared a scrapbook page using this collection yesterday. 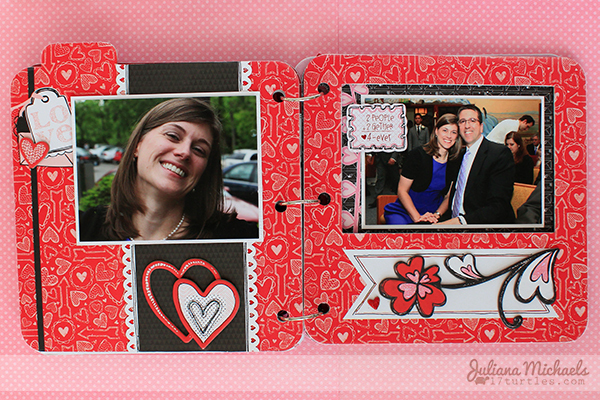 Today, I have a scrapbook page I created with a photo of me helping my nieces decorate their Valentines boxes last year. I really enjoyed helping them and watching them have fun as they each personalized their own box. 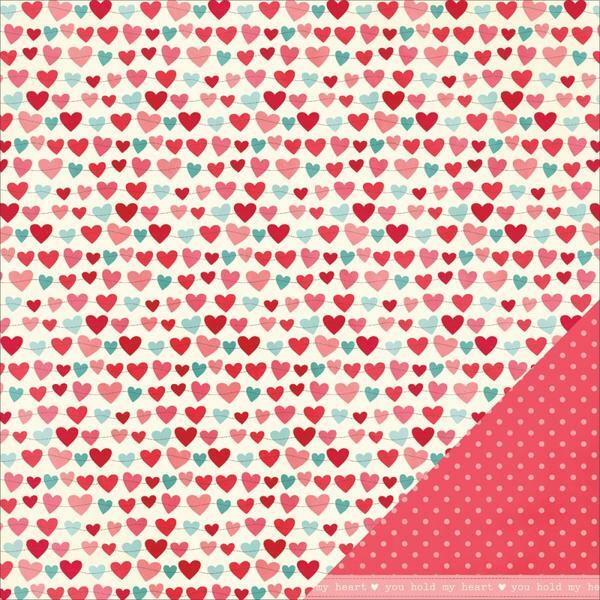 As I created the design, I was inspired by one of the sheets of paper in the Yours Truly collection called Heart Strings. All those little hearts stitched together were calling my name. I was inspired to create my own "heart strings" by stitching on some heart stickers from the Yours Truly! Once I adhered the stickers to the paper, I used a pencil to draw a line to help guide me as I stitched with my sewing machine. After I was finished with the stitching, I simply erased the pencil line. 1. 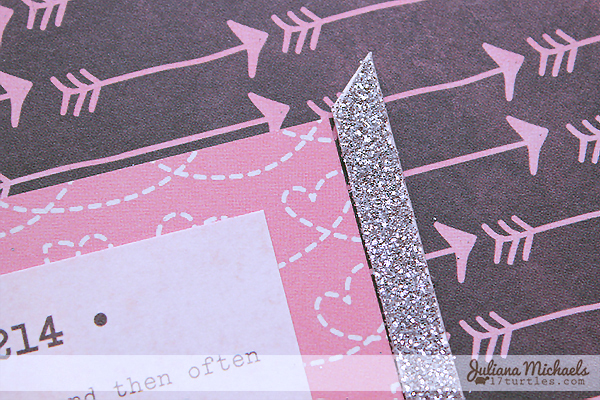 Cut four 0.25" x 12" strips from the Silver Glitter Paper. 2. 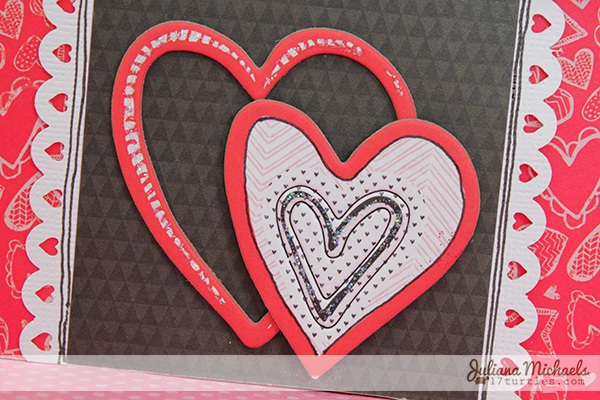 Place one of the glitter strips along the left side of the paper and draw a 45 degree angle on the top edge of the strip with a pencil or marker. 3. Cut the angle with your scissors. 4. Adhere this strip to your layout. 5. 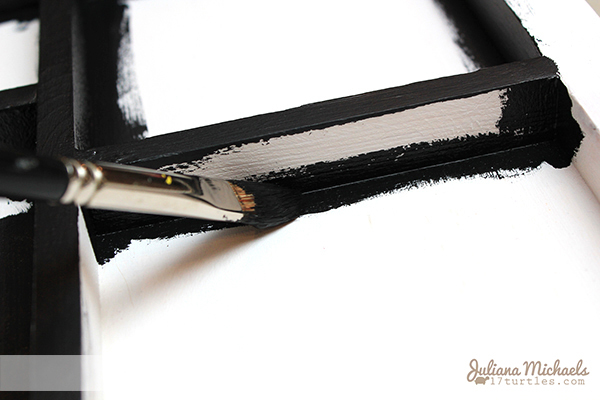 Take another strip and position it on the top side of the paper. 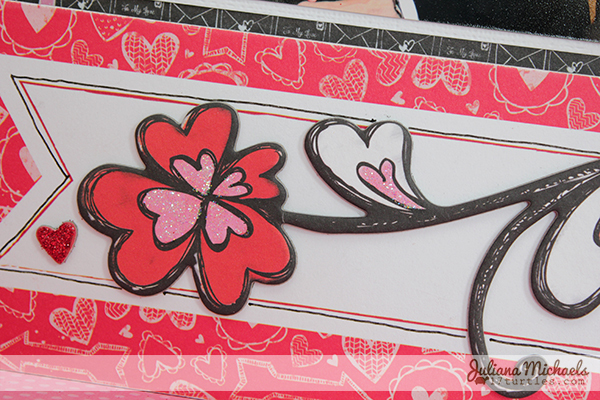 Overlap the strip with the one you just cut and draw another 45 degree angle on the edge of the strip. 6. Cut the angle with your scissors. 7. 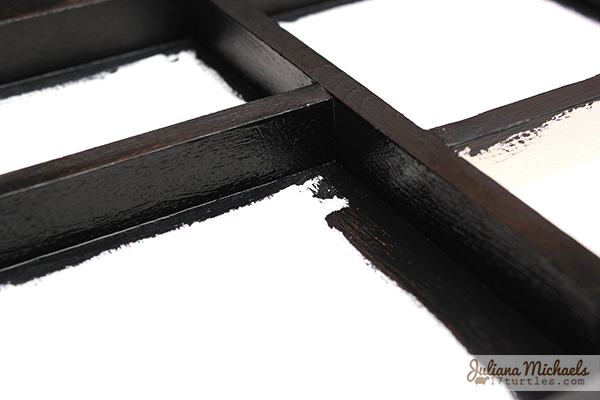 Line up the edges and trim again if needed to help them line up closely. 8. 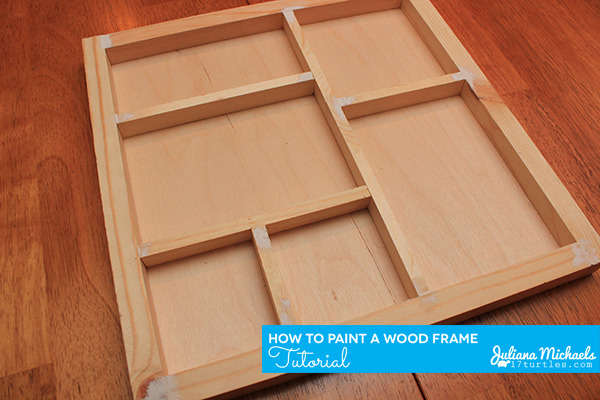 Repeat this process all the way around the paper until your frame is complete. 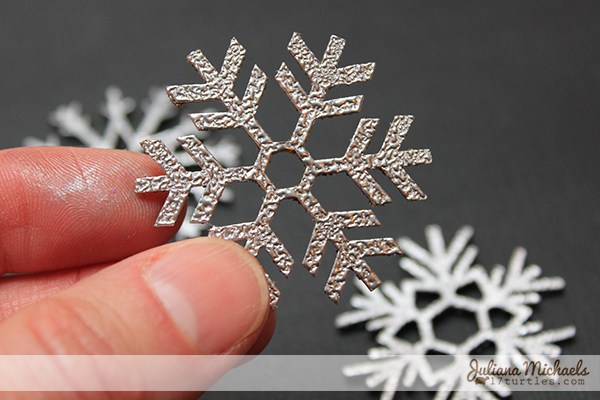 Of course, I realize it would be easier and faster to just mat the entire piece with a piece of the Silver Glitter paper, but this technique will help you "stretch" your stash and allow you to create more projects with just one piece of paper. So how do you save money and stretch your stash? Do you have any fun tips like this you can share? I'd love to hear them!